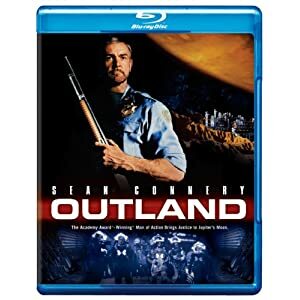 Released a mere two years after Alien, it was pretty clear that the 1981 Peter Hyams directed and Sean Connery starring movie Outland took as much from that film’s sci-fi visuals as it did, story-wise, from the classic 1952 western High Noon. Like Alien, the look of the Jupiter mining station is generally grim and gritty, with dark, well worn equipment and characters who look like they belong in a mining town (as opposed to Alien, where the characters appeared for all intents and purposes like interstellar truckers). The plot of the film is essentially identical to High Noon: Sheriff of the town/colony takes a stand, killers come in on the next shuttle/train, which is due at a very specific hour. During the wait, the Sheriff tries to enlist the aid of others in fighting the killers, is rebuffed. Yes, Outland is High Noon in space, and given my tolerance for “homages”, you would think that would instantly turn me off from this film. There is also the secondary issue of logic, which the film sometimes lacks, particularly regarding the whole idea of gun play. As the movie is set in an environmentally sealed outer space colony, you would figure guns would be, if not banned outright, kept under very, very tight control. After all, one stray bullet could prove catastrophic to everyone should it rupture a wall or damage some sensitive equipment. Yet the guns are fairly plentiful, and the shootouts are on the level of a western. Now that I’ve described the bad, let me state the good: Outland is a solid piece of entertainment. Sean Connery is good in the heroic role, the story moves well, and the bad guys are fearsome. However, this is one of those films that seemingly is forgotten today. The DVD was released some time ago and the reviews of it were quite brutal (I believe I have it somewhere in my collection but never watched it). Not much information on the extras (if any) are provided, thought this review does note that we get director commentaries. Anyway, I’m intrigued. In conclusion, if you’re in the mood for some grim and gritty sci-fi action that has the look of Alien and the plot of High Noon, you should check out Outland when it arrives on Blu Ray this week.